You’ve probably heard that getting reviews for your business is important. What you don’t always hear about is what happens next. In the long run, what you do with the reviews you get is probably even more important than the reviews themselves. The problem is that, even when you do your best to incorporate a review strategy and provide great customer service, review blunders happen. You’ll get bad reviews. You’ll make mistakes. The good news is that, when you’re on top of your review strategy and aware of what people are saying about you, a little mistake won’t wreck your reputation. 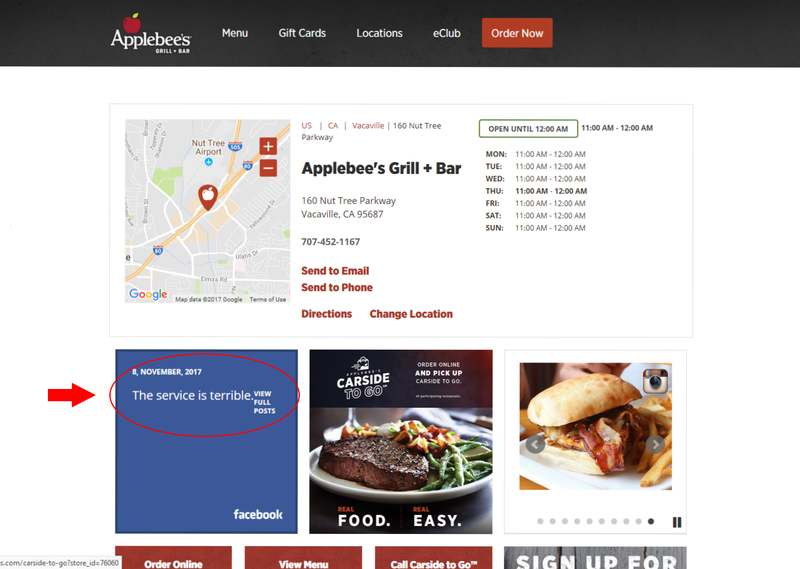 You can see that Applebee’s put in the effort to get reviews on Facebook and pull those reviews to its website. Unfortunately, it has randomly pulled a negative review to the site, which is displayed prominently to anyone checking store hours or looking up the phone number. It’s promoted on the restaurant’s contact page. It’s displayed outside of the context of other, more positive reviews on Facebook. How could Applebee’s have avoided this issue? We generally suggest businesses avoid automatically pulling reviews from outside sites onto their own pages. When you do, you lose control over what visitors to your website will see. You don’t know if the reviews you display are good or bad, and you don't know what the reviews are about. Even a positive review for one of your service areas might automatically pull to a different service area on your site. Imagine looking up a lawyer’s wrongful death practice area and seeing a review for drunk-driving defense. At best, it’s confusing. At worst, it can be tactless and offensive to your audience. That’s why it’s important that you maintain control over what is shown on your website. Another option for avoiding this kind of mistake would be to use a conditional review request format, like we use in our Reputation Management Tool. This makes it more likely that negative comments and experiences are captured by your customer service team before a negative review is posted. Responding poorly to a bad review. Almost every business has received a bad review at some point. However, negative reviews can also be an opportunity to show off your responsiveness and customer service skills. Negative reviews can also add to the credibility of your reviews overall. If you respond inappropriately, though, you risk looking unprofessional and giving more credence to the bad review. Instead, find out how to respond the right way to a bad review of your business. Responding too late. If you haven’t really been looking at your reviews on outside review sites, you could be in for a surprise when you finally do. Keep in mind that responding to a review two or three years later can be worse than just letting bygones be bygones. Posting a response years after the review was made just makes it clear that your business wasn’t paying attention before—and, bottom line, it just looks weird. Stacking the deck. Don't ask your staff, friends, or family members to leave reviews on your profile. That can be seen as spamming by Google. It should go without saying, but never buy reviews! If getting more reviews is your goal, you should focus on creating sustainable processes that naturally stimulate reviews from your happy clients. Your reviews may vary, but the most important part of any review strategy is to simply know what people are saying about you. Are you ready to get a jump on your review strategy for 2018? Contact us now to schedule a free demonstration of our Reputation Management tool in DSS.